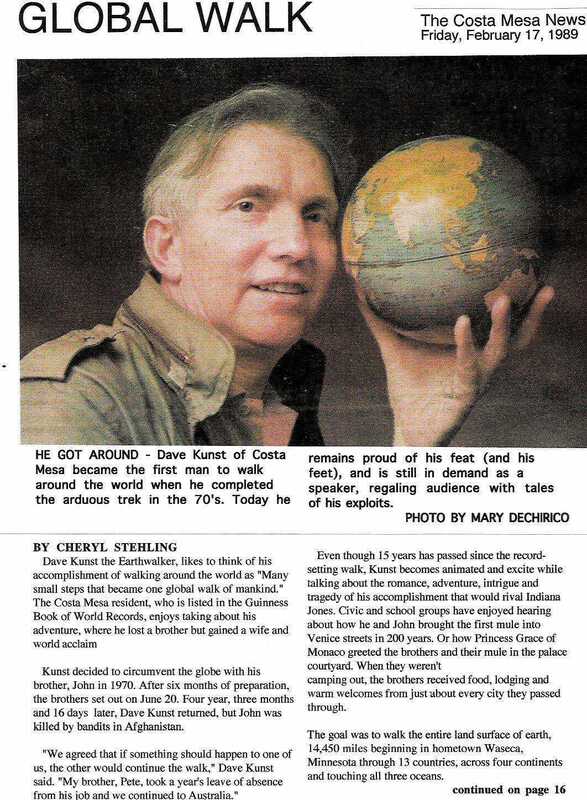 Dave Kunst is the first person verified to have completed circling the entire land mass of the earth (with exception of the oceans) on foot. 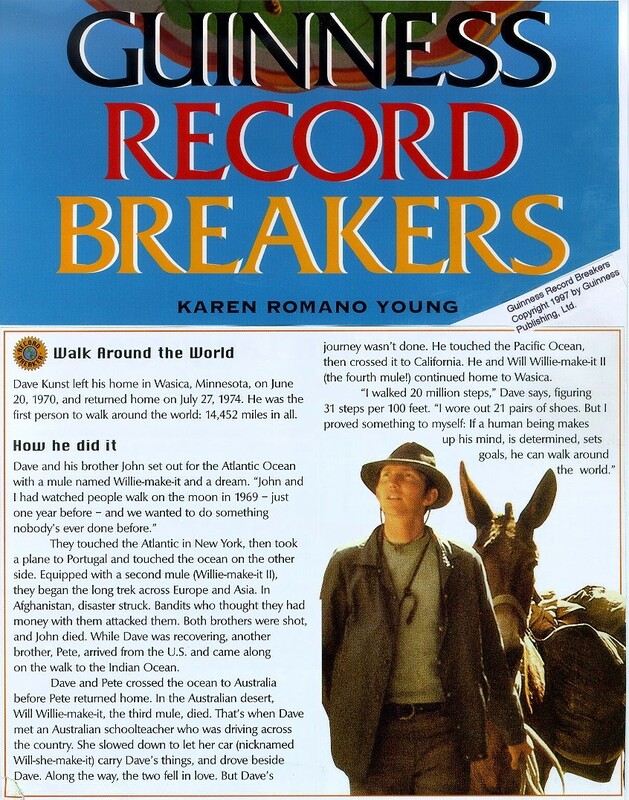 The Earthwalker carried a torch in the 1996 Olympic Torch Relay and he is featured in the 1997 Guinness Record Breakers Book. With help from his brothers John and Pete, and Jenni Samuel, an Australian School Teacher, Dave walked 14,450 miles round the planet earth. See the World Walk Map. Earthwalk is an awesome, almost unbelievable tale about an amazing historical Odyssey that shows what can be accomplished by a determined and motivated human being who sets a goal. Many small steps became one giant, global walk of mankind. The hardcover book, The Man Who Walked Around the World, published by William Morrow in 1979, documents the walk. 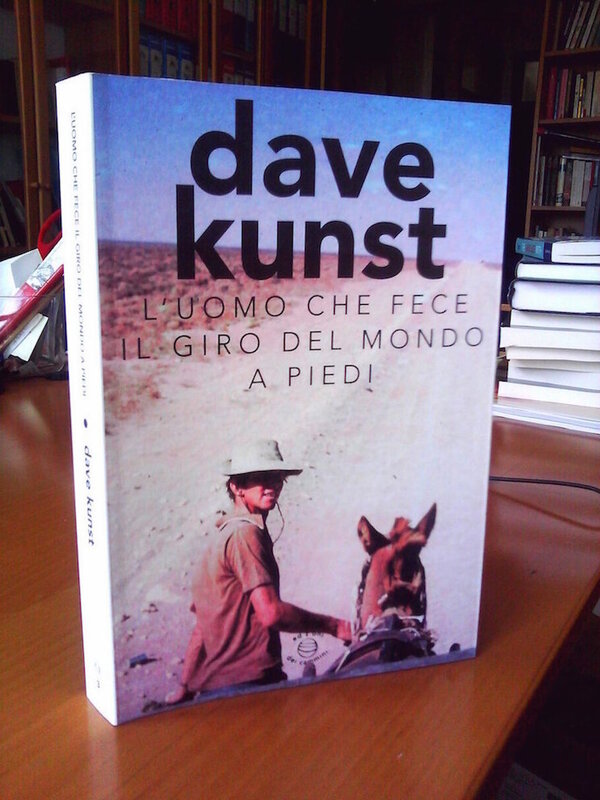 A paperback book was also published in Italian in 2015. In addition to the books, this epic adventure is documented at the Minnesota Historical Society, the Houston County Historical Society , and the Waseca County Historical Society. It is also featured in the 1991 Guinness Book of Records, the 1989-90 Guinness Sports Record Book and Ripley's Believe It or Not! A Guinness list of different ways to circle the earth was also published in the 1991 edition of the Guinness Book of World Records. 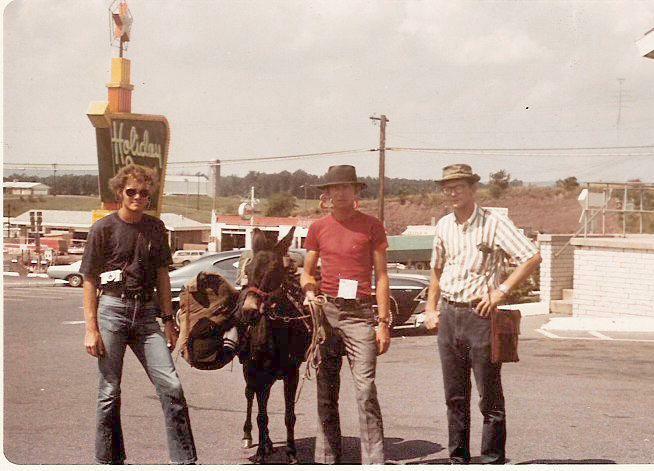 Earthwalk is a true story about three brothers, four mules, two dogs and an Australian School Teacher. The adventure is also listed in the 2006 edition of the World Almanac Book of Records, Firsts, Feats, Facts & Phenomena. 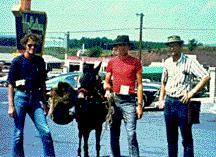 On June 20, 1970, Dave and John Kunst walked East out of Waseca, Minnesota with a pack mule named Willie Makeit. 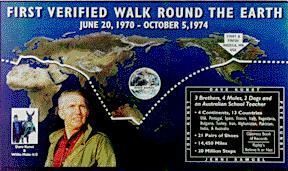 On October 5, 1974, Dave Kunst walked back into Waseca, Minnesota, from the west, to become the first person verified to have circled the land mass of the earth on foot (John Kunst was shot and killed by bandits half way around the world in Afghanistan on October 21, 1972). Dave and John Kunst walked from Waseca, Minnesota, to New York City and touched the Atlantic Ocean. They then flew across the Atlantic Ocean to Lisbon, Portugal and touched the Atlantic ocean on the other side. 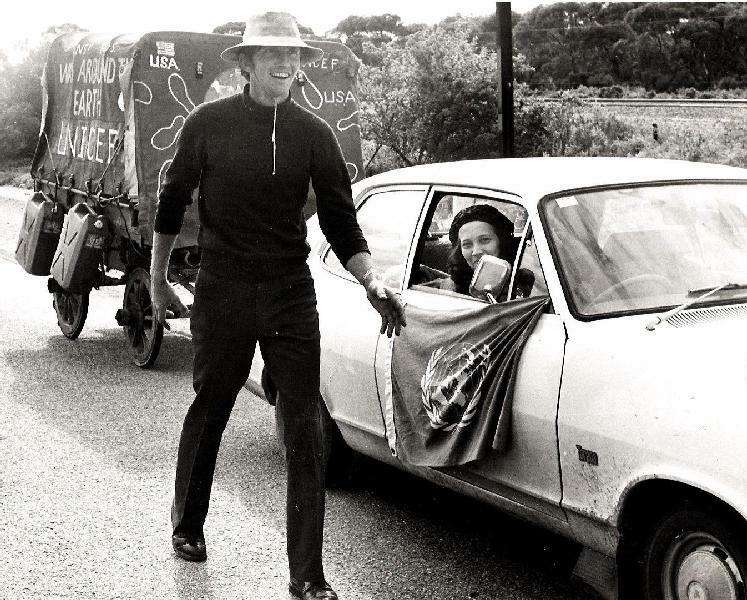 Walking across Europe and Asia to Calcutta, India, Dave touched the Indian Ocean. He then flew across the Indian Ocean to Perth, Western Australia and touched the Indian Ocean on the other side. Walking across Australia to Sydney he touched the Pacific Ocean. He then flew across the Pacific Ocean to Los Angeles, California, and touched the Pacific Ocean on the other side. He then walked from Newport Beach, California, back to Waseca, Minnesota, where he started, becoming the first person to walk round the earth. The walk took four years, three months and sixteen days! Dave walked 14,450 miles crossing four continents and thirteen countries, wearing out 21 pair of shoes, and walking more than 20 million steps. 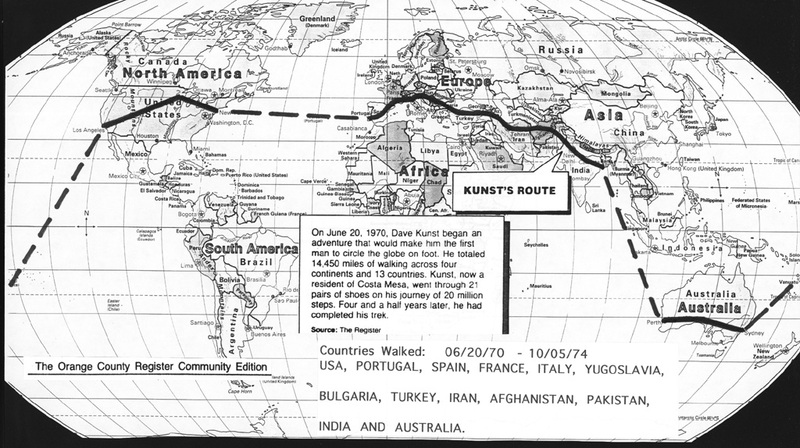 The EARTHWALKER carried a plastic scroll with him around the world to document the walk. He had the mayor of every city and town that he spent the night, stamp and sign the scroll. When the walk was finished there were six, one- foot by five-foot, scroll sheets that were totally covered with stamps and signatures of officials around the world. Dave and John had many wonderful experiences walking across Europe, including a visit with Princess Grace of Monaco. Willie Makeit II, the Portuguese pack mule, was a big hit with the princess who accepted a lucky mule shoe from the brothers. While walking through an Italian town, John and Dave were invited to have dinner in a small restaurant. When Dave went to tie Willie to a tree the owner of the restaurant said, "No! No! Bring the mula inside." Dave said, "We can't take a mule inside a restaurant!" "Yes! yes! follow me," said the man, "I want to cause some excitement." Willie Makeit was taken inside where she bumped tables knocking over bottles and glasses, and spilling drinks on the floor. The mule caused quite a stir and many of the Italian people who were having dinner jumped up saying, " Mula! Mula! Mula!" Then the owner made a comment in Italian and everybody started to laugh. 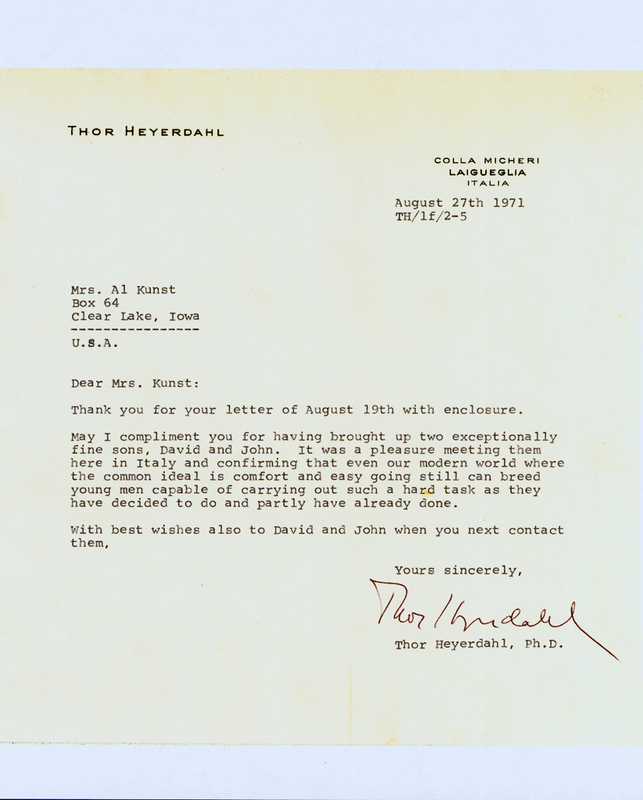 To the brother's surprise Thor Heyerdahl was having dinner in the restaurant. The Norwegian Scientific Adventurer was impressed with the brothers and their walk. He got a big kick out of the mule in the restaurant and even patted Willie affectionally on her nose while he chatted with the brothers. 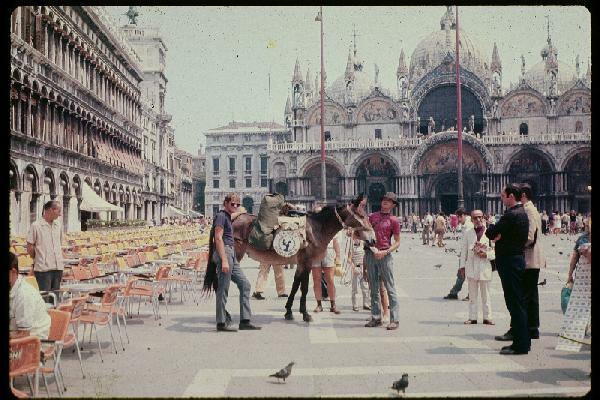 Arriving in Venice, Italy, Willie caused some real excitement while crossing the canal bridges. Mules and horses were not allowed in the city because of the narrow streets, the pollution and the bridges. The Italian people were pointing and shouting but the brothers didn't understand. The number one problem they had walking round the world was the language problem. The Kunst brothers could only speak and understand English. The Mayor of Venice finally agreed to let Willie stay in the city but all her messes had to be cleaned up. A Yugoslavian farmer gave the brothers a dog, but in the mountains of Western Turkey drifter was attacked and killed by Turkish sheep dogs. An American family living in Ankara, Turkey, replaced Drifter with Drifter II a Turkish dog. Drifter II didn't like walking all day so something had to be done. In Istanbul, Turkey, the brothers were told by the American Consulate to get a small wagon. The Turkish tourist bureau also insisted they must have a wagon to carry the water and food they would need to cross the deserts in Iran and Afghanistan. 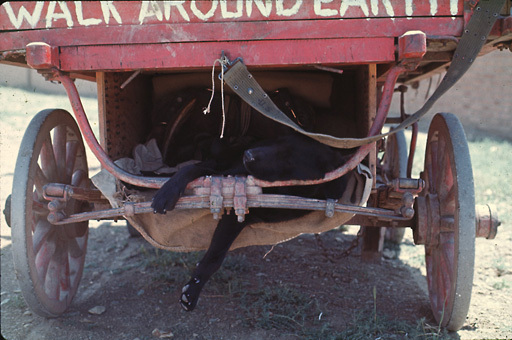 A dog house was built under the wagon so Drifter could ride, thus solving that problem. The commander of an American Military Base just outside of Istanbul had his men put a canvas cover on the Turkish Wagon. That meant no more sleeping on the ground because the supply wagon became a shelter for the night. The brothers called their home on wheels the USA-Turk Machine. In Iran a camel driver wanted to trade his fine camel for the big Portuguese mule, he kept saying, "Yes! Yes! Yes!" Dave kept saying, "No! No! No!," because the brothers wouldn't walk a mile with a Camel! The man was serious and called some of his friends. John was concerned they might take Willie. Dave then remembered what he had been told at the American Embassy in Tehran that if they were confronted by locals they should have some American dollars handy (Iranian village people only made what amounted to a couple of American dollars a week and the money would probably capture their attention). Dave then reached into his pocket and pulled out a fist full of dollars. The camel driver's eyes got very big and he grabbed the bills out of Dave's hand. While the Iranians were fighting over the cash, the brothers walked out of town. Halfway around the world in Afghanistan, Dave and John walked through the Desert of Death where temperatures hit 128 degrees. But it was in the foothills of the Hindu Kush Mountains of Afghanistan that bandits attacked. They thought the brothers had money in the Turkish Wagon. An Afghan newspaper printed by mistake that the walkers were collecting money for UNICEF. The fact is they were telling people to send money to the Children's Fund but the Afghan reporter misunderstood because of the language problem . When the bandits started shooting Dave was wounded and John was shot and killed, ending his search in life. It took Dave four months to recuperate and then his other brother Pete took John's place. 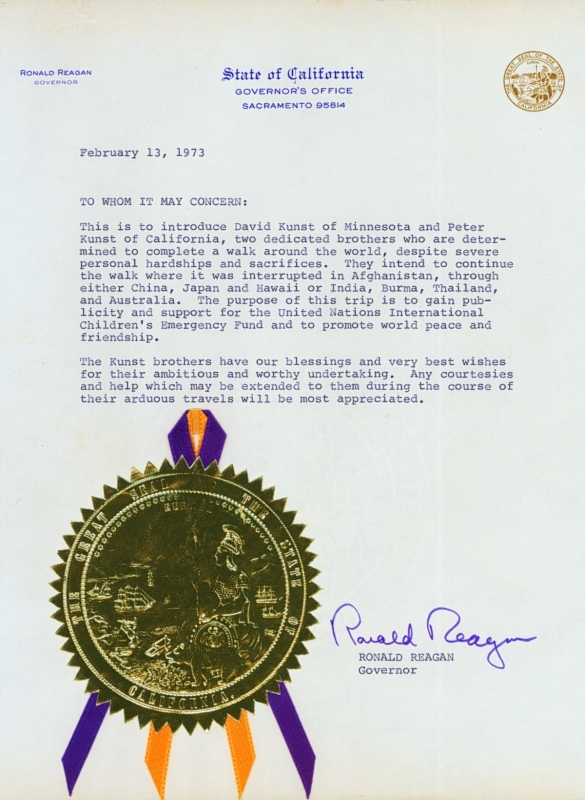 Pete brought along a letter of recommendation from then Governor Ronald Reagan of California. 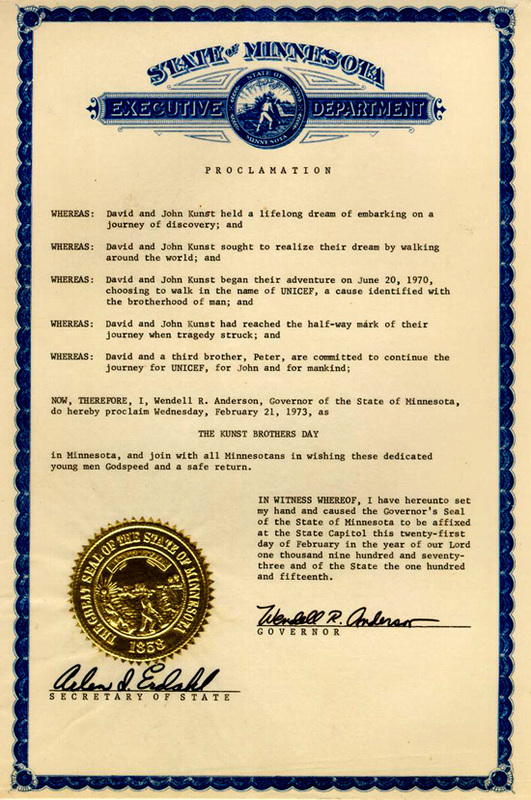 To honor John's memory and to show special recognition for the walk, the governor of Minnesota proclaimed Wednesday, February 21, 1973, to be "KUNST BROTHERS DAY." Governor Wendell R. Anderson also presented the brothers with a wooden plaque shaped like the state of Minnesota with an inscription on a brass plate. Read Al Austin's editorial comment about the KUNST BROTHERS on WCCO-TV, October 24, 1972, which is a tribute to all who chose the path of adventure. 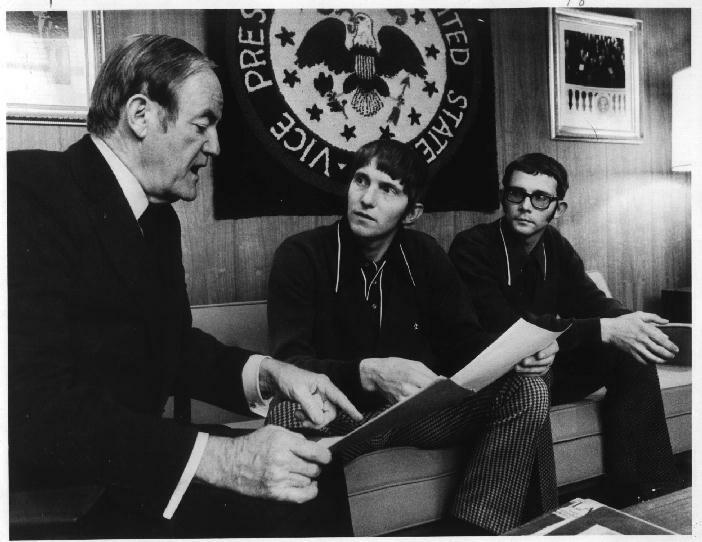 Dave and Pete met with Senator Hubert H. Humphrey, from Minnesota, just before they restarted the walk in Afghanistan. John and Dave had met the former Vice President just before the start of the walk in 1970. At that time he presented them with a letter of recommendation and mentioned that he would follow their progress across the world. 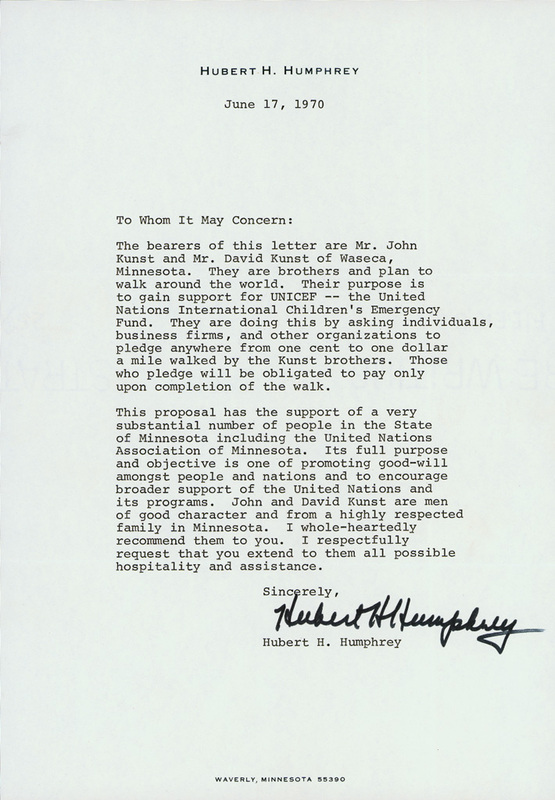 Senator Humphrey also attended John's funeral in Waseca. 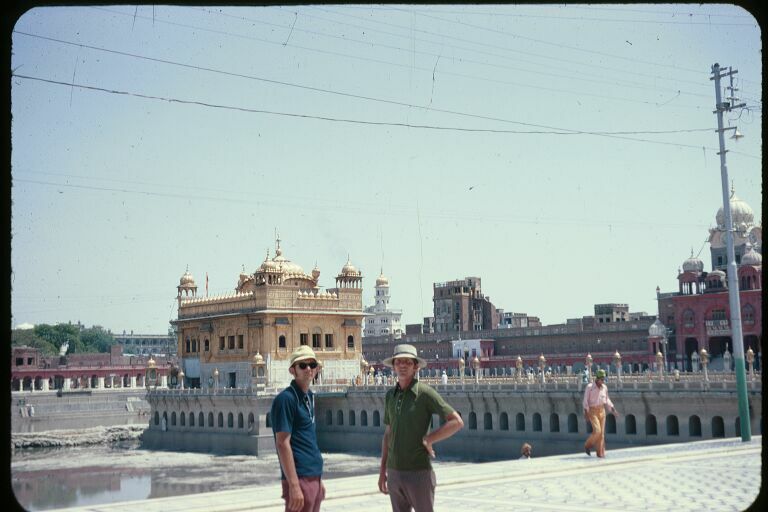 Early in 1973, with the help of the American Embassy, Dave and Pete started at the EXACT spot in Afghanistan where John had been killed and the walk continued into Pakistan. The brothers got special permission to walk through the Khyber Pass of Pakistan because a Pakistani tribal prince agreed to walk with them. 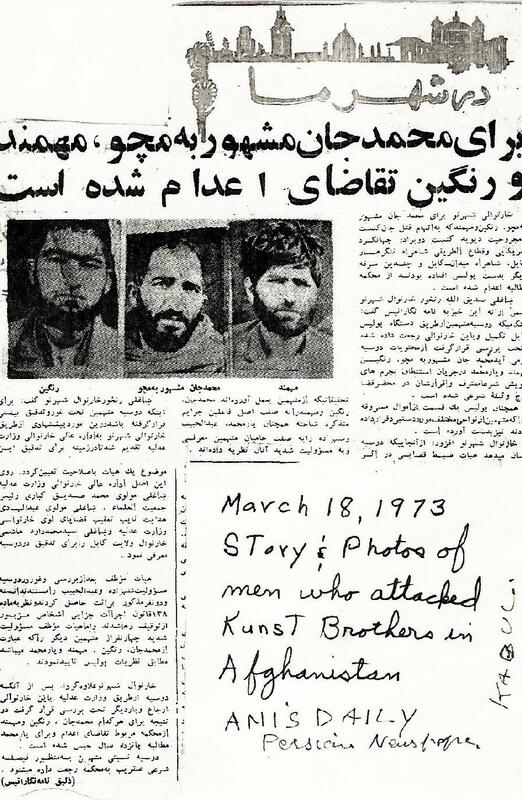 It was printed in a Pakistani newspaper that the Kunst brothers were the first non-Asians to walk to and through the Khyber Pass since Alexander the Great. The prince pointed out plaques on the mountainside identifying many of the British regiments including the Khyber Rifles, that served in the area . He said they were a memorial to the twelve-hundred- ninety-six British solders who were massacred by Pathan tribesmen in 1847. Arriving in Islamabad, Dave and Pete were welcomed at the American Embassy. After rest and relaxation they continued to Lahore, Pakistan, and then into the Punjab area of the Indian subcontinent stopping in Amritsar, India, to visit the Golden Temple. Passing the Red Fort on their way out of New Delhi, Pete, Dave, Willie Makeit II and Drifter II followed the Grand Trunk Road walking through the masses of India during the Monsoon Season. After touching the Indian Ocean near Calcutta, India, the brothers and their Turkish Wagon crossed the Indian Ocean to Perth, Australia. Willie Makeit II and Drifter II had to stay in India because Australians don't allow animals into their country. Willie was given to an Indian who owned horses and Drifter was given to an American Lady at the American Consulate. Australia, the world's largest island and smallest continent is two-thirds desert so they took the Turkish Wagon (Australian Tourist Commission provided the brothers with a mule to pull their Turkish supply wagon but there was a big problem? The Aussie mule kept running off with the wagon and almost wrecked it twice. Montie Montana Jr. was in Perth to promote his Wild West Show and the American cowboy offered to help. Montie visited the mounted police stables where she was stabled and showed Dave and Pete how to stop a mule from running off with a wagon. He tied a rope around both front legs and when the critter started to run with the wagon, Montie pulled her front legs out from under her. Down she went with the wagon almost on top of her, and that was the last time she ran off with the wagon). It was January, which meant summer time down under and there were over a thousand miles of desolate outback to walk. With an Aussie mule, named Will Willie Makeit II, the brothers headed across the Nullarbor Plain. It was hot, dry and dusty and it was the fly season so the brothers were bothered by thirsty flies trying to get moisture from their nose, mouth and eyes. The Australian people were friendly and helpful like the family who posed with Dave and Pete in front of the Club Hotel. Halfway across Australia, Pete, who had taken John's place for one year, had to return to his job in California. A few days later Will Willie Makeit II died of a heart attack and Dave couldn't find another mule. It was Australian sheep country and there weren't any mules for a thousand miles. He was about to continue without the wagon when an Australian school teacher named Jenni Samuel drove up to have a chat and ended up taking Willie's place. 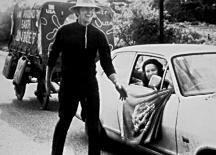 Jenni agreed to tow the wagon with her car one thousand miles, in low gear, to Sydney while Dave walked along side. Dave and Jenni had fallen in love. However, the walk continued and after touching the Pacific Ocean and kissing Jenni good-bye, Dave flew back to the USA. The Mayor of Santa Ana, California, presented him with a mule retired from Knotts Berry Farm. Touching the Pacific Ocean at Newport Beach, California. Dave started the final leg of the walk. When the California mule got tired and stubborn Dave left Willie Will Makeit II and walked alone across the western USA. According to the officials at Colorado's Eisenhower Tunnel, Dave was the first person to officially walk through that underground passage. On October 5, 1974, the EARTHWALKER walked into Waseca, Minnesota in triumph as the first person to have walked round the earth. Find out how it was possible to walk the world. After the walk Dave returned to Western Australia to get Jenni. A year later he brought her to the USA where they got married. Today they are still happy and together living in Orange County, California. Dave has told his amazing story to school children and adults throughout the United States. The Earthwalk story is a remarkable story, and you have to hear the EARTHWALKER tell it to believe it. No one has walked the walk he walked and no one can talk the talk he talks! Check out the Earthwalk Presentation on YouTube. Dave Kunst is an author and lecturer and has been featured in numerous magazine and newspaper articles during and after his walk. One such example would be the story in the Campus Press, from Boulder, Colorado. 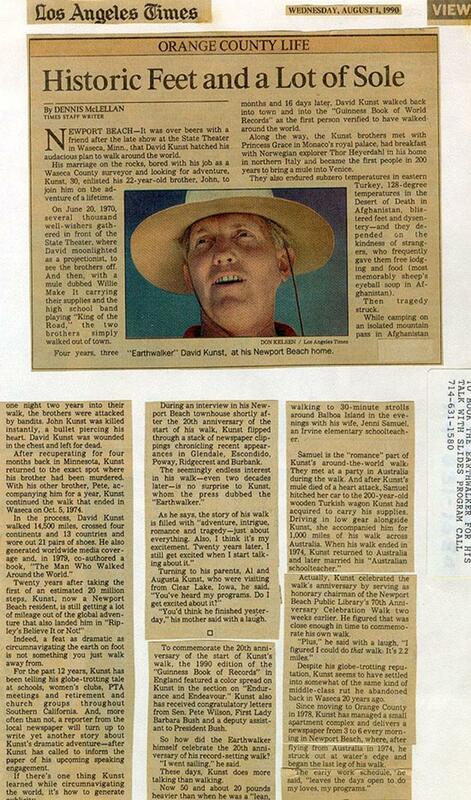 In 1996 Dave was selected as a Community Hero Torchbearer for the Centennial Olympic Games in Atlanta. He carried the torch near Dana Point, California, on Sunday, April 28, 1996. After finishing the short walk, Dave said, "It was the most exciting walk I've had since I finished walking round the earth on Saturday, October 5, 1974." Dave will be donating his Olympic Torch to the Minnesota History Center to be displayed with other paraphernalia from the walk. The World Public Library features the Kunst brothers adventure walk. To contact the EARTHWALKER for more information you can E-mail him at earthwalker1@earthlink.net. References available upon request. Inquires welcome. 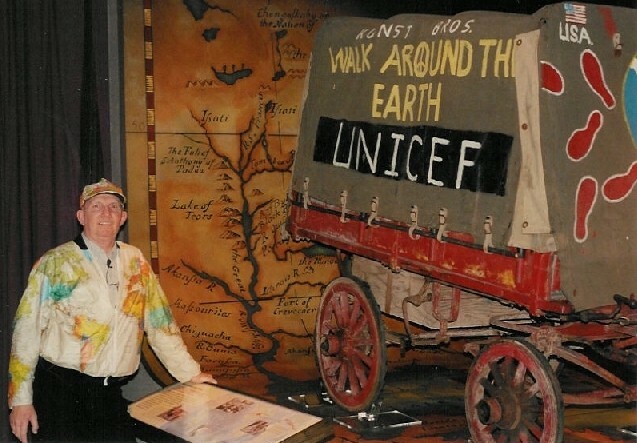 The Minnesota Historical Society commemorated the Kunst brother's walk around the world with an exhibit at the History Center in St. Paul, Minnesota, from July 9, 2002, until July 9, 2004. The exhibit featured the wagon that the Kunst brothers used during the walk, along with some other artifacts. 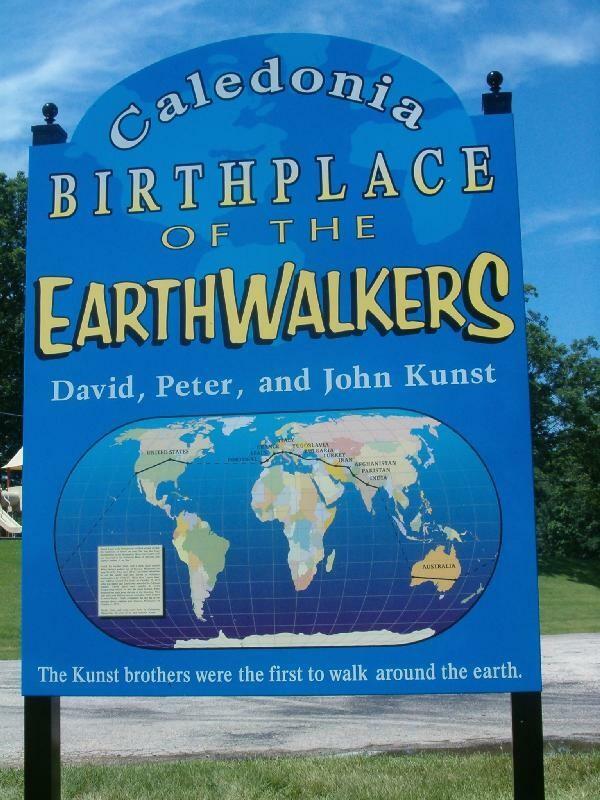 Caledonia, Minnesota, the birthplace of David, Peter, and John Kunst, honored the brothers with a big, beautiful sign, and an awesome bronze plaque on June 11, 2004. Dave has put together a collection of photos and newstories which can be downloaded. Click on one of the links below.